It had rained continuously for four days prior to our departure from Homer, AK. Alex and I had grown weary of it and looked forward to Kodiak with great anticipation. After a restless night on a rolling sea I stepped out on deck to get a better look at Kodiak’s coastline. The cold brisk air felt so refreshing on my face. Far below I spotted numerous small dark birds sitting on the surface. I trained my binoculars on them was greatly pleased to see that they were horned puffins. Finally, after almost forty years of bird watching I saw the one species that is probably more often depicted on posters and magazines than any other. In my excitement I offered the binos to my neighbor at the rail but he politely declined and stepped away. There were bird gatherings everywhere and when the mighty ship came near they dove below in a comical attempt to escape danger..
Alex and I had come to Kodiak to pursue silver salmon. What we found, however, was much more than that. Kodiak is a very wet place. Yet, somehow I found it to be very spiritual. The rain doesn’t pour down as in the tropics. There is, instead, an ever present fine mist throughout the days. The natives seem to totally ignore it and did not find it discomforting. They walked about in shorts and tee shirts in the rain. The sky was seldom entirely cloudless. Sunny days are particularly glorious on that island. The reflections of clouds on sunlit waters can leave you mesmerized for hours. Alex and I had an experience like that near the waterfront. We stood and watched the light and reflections change as small fishing boats passed below. 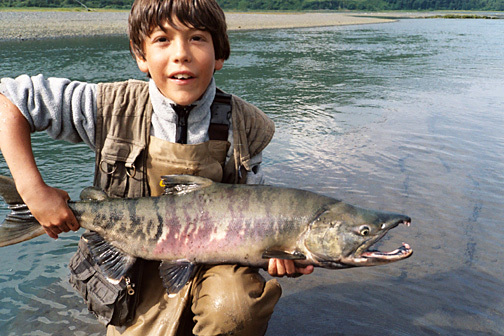 Upon arrival my son and I drove directly to the mouth of the Buskin River. A few fishermen were catching pink salmon and I was happy to see that they were chrome bright fish. The tide was just starting to enter and it was easy to see them from the banks. We caught numerous fish that morning, fish that were in the 3-5 lb range and that fought really well. We set up camp at the Buskin campground and that remained our home base for the following two weeks. 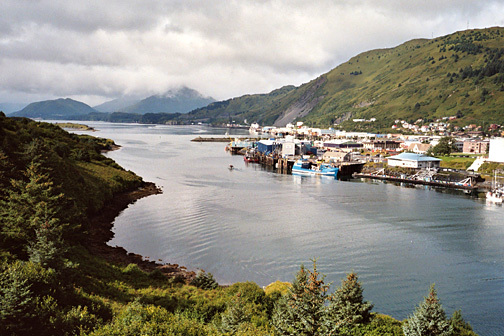 The town of Kodiak was so close that we soon stopped preparing our meals and simply ate out every day. Two solid week of Big Macs for me and chicken selects for Alex. After our initial excitement with pink salmon we started to lose some of our enthusiasm. Their numbers were so staggering that there was simply no challenge to catch them. In fact it was a challenge to not catch them. It became a challenge to catch something other than a humpy. The abundance of pinks gave me an opportunity to truly test the effectiveness of the various fly patterns. A dark purple egg sucking leech was a favorite for many at Kodiak and it worked pretty good. I tried bunny leech patterns with lead dumbbell eyes in various colors and found the hot pink to be the best. This became my number one fly for silver salmon later on. A local angler tipped us off to the chums in the American River. There weren’t many but they certainly were fun. We found them in the deeper holes that bordered the steeper banks. Large powerful fish, their runs upstream would go deep into the backing followed by a similar run in the opposite direction. We really liked it when they went airborne. They crashed back into the water like giant boulders throwing spray in all directions. 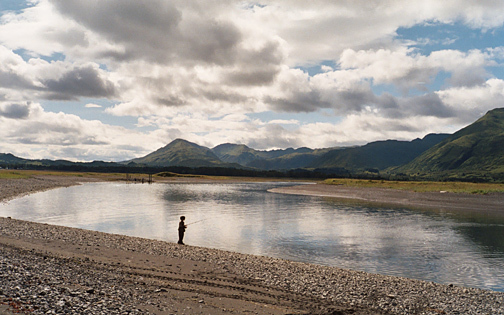 Not many people are aware of the good trout fishing available on the island. We soon discovered that not all of those dark shapes were salmon. 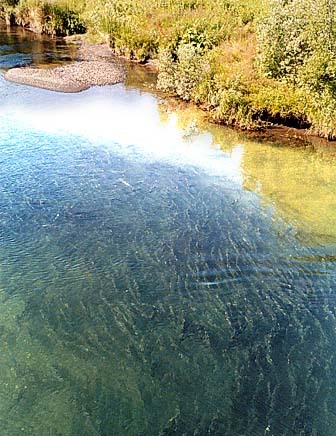 There were dolly vardens and rainbows along the edges of groups of salmon and they were waiting. A 5 wt rod was ideal for these fish. We worked our way upstream with a strike indicator and a plastic bead egg above a bare hook. I caught a couple of dinners that way. Alex never seemed to tire of these fish and I would often sit atop the highway bridge and direct him below to where they were. Most dollies were quite small but we caught them up to six pounds. The large spawning males were the peacocks of the species. 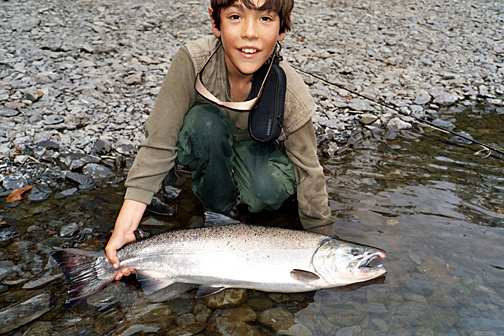 Each evening at the campground we talked about the silver salmon. Where were they, we wondered. There were reports of fish here and there. We finally saw them at the mouth of the Olds River. Notice that I say ‘saw’ them, not caught them. The mouth of the Olds was to me one of the most beautiful spots on an island filled with beauty. It formed a wide lagoon of such clear water as those I had seen in the south pacific. Large schools of humpies cruised aimlessly along the shoreline. It was so much fun to sneack up on them on all fours and strip a small shrimp pattern in front. The silvers were there also, defiantly exploding out of the water like polaris missiles for no apparent reason. They just left me muttering to myself about the unfairness of it all. Mostly, I liked the feel of this place. Fishing was secondary at the Olds. I often sat on the beach with an old log for a backrest and just took it all in. Lunches were long restful affairs here, watching and waiting for the tide to rise. I would put on the polaroids and observe the flash of starry flounders drifting in with the current along with the algae. Everything changed on fateful morning. After breakfast we left our campsite and walked through the woods to the shores of the Buskin River. To our amazement we stumbled across a local cleaning a couple of glorious silver specimens. “They’re here”, he said matter of factly nodding to the left, “everywhere”. I couldn’t believe our good fortune. We hurried back to the campground to get our possessions. By the time I had assembled my tackle Alex was already into a big one. I’ll have to admit I was a bit miffed. It wasn’t supposed to happen that way. It was a magnificent fish, though. It lay still in the shallows as I shot a very proud moment of my son. They were difficult to see at first. Despite their large size they were hard to distinguish from the pinks. But what a thrill they are on the end of a flyline! The first fish ran downstream with me stumbling with my bad knee in full pursuit. The line screamed off the reel as it dashed through the riffle to a shallow run, holding near the bank under the alders. Once I reached it it started a second run, racing through the shallows with its back exposed. Throwing spray into the air it bore further and further downstream leaving me with no option but to follow. It finally settled down in a very wide, deep pool that was loaded with other salmon. There it made it’s final stand which was uneventful compared to its dash for freedom. The locals had a very efficient but unusual way of catching silvers with flies. Called ‘lining’ the fish, it was done in the following manner. 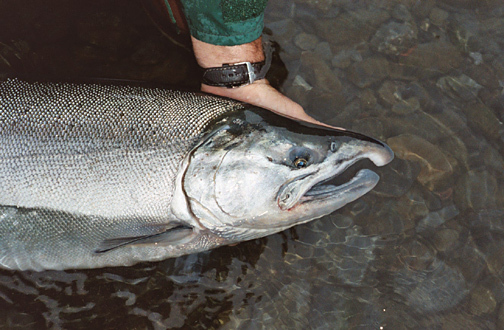 A large salmon was aggressively pursued until it allowed the angler to approach it within about ten feet. The fly was repeatedly cast in front of the fish and allowed to drift to the head vicinity. It was then slowly pulled across its mouth lodging the hook in its jaw. 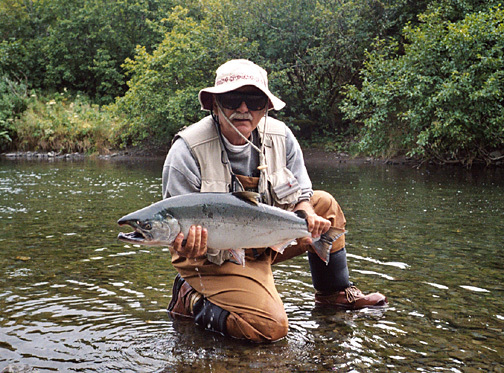 I used this manner of fishing to catch eleven large salmon the first day of the run. I soon rejected it and even became hostile towards those who used it. My biggest complaint was that these anglers tended to destroy the fishing for all others. The aggressive wading through their midst would drive the entire school into such a state of anxiety that it became impossible to fish in the standard manner. I finally complained to a biologist, a census taker, who investigated the matter but upon finding the fly implanted in the fish’s jaw told me that it was perfectly legal and she would do nothing about it. As the silver run grew in size this method of fishing seemed to grow less popular. 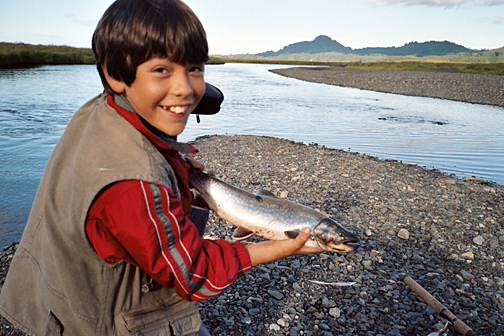 It’s very popular throughout Alaska, however, and argument rages on with great emotion among anglers. Before long it was time to head for home. The rainfall had increased dramatically by this time. I rose up at dark on that final morning and dressed in the falling rain. Stumbling and sliding down the muddy trail I pushed wet branches aside as I worked my way downhill to the best hole on the Buskin. There was nobody there. Squinting in the predawn darkness I slowly examined every dark object along both banks for any movement. I had developed a healthy fear of bears. Settling down on the finest stretch of real estate I set up my 8 wt and cast across the slow current. I hooked a pink on my first cast. The others soon started to show up but I just kept catching fish. I landed five legally hooked silvers and a wheelbarrow full of humpies before deciding it was enough. 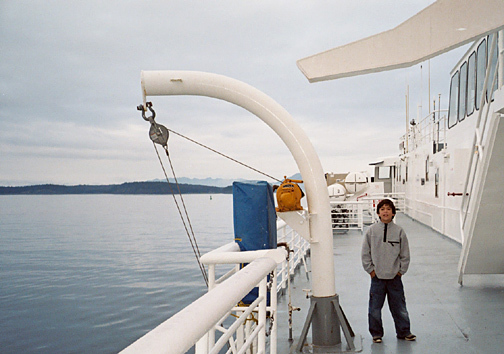 Once at the car I got out of the wet clothes, woke up Alex, and headed back to the ferry terminal.